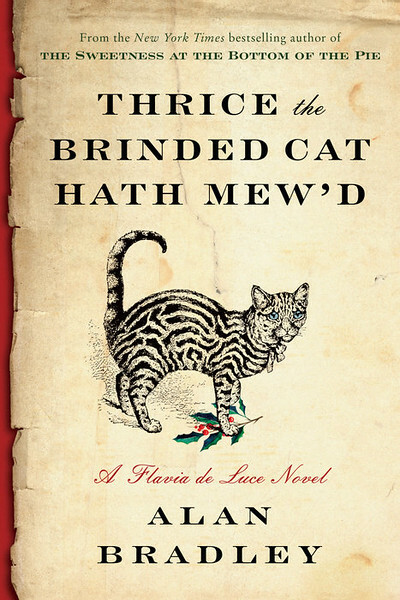 A book review of Thrice the Brinded Cat Hath Mew’d by Alan Bradley. Post may contain affiliate links. I admit, when you read an Alan Bradley book you know exactly what you are getting. That’s not necessarily a bad thing. When I go to my favorite restaurant and order my favorite dish, I want it to taste the same as last time. I expect it to be exactly the way I remembered it. Such is the way with Alan Bradley books, Thrice the Brindled Cat Hath Mew’d is exactly what I expected and that’s why I read it. When you read a Flavia de Luce mystery, you know exactly what you are getting. Flavia will be feeling put upon by her family. She will stumble across a dead body. The police will begrudgingly work with her. She will use science in fun and quirky ways that you never knew were imaginable. She will follow clues that leave you clueless. There will be humor, mystery, and charm. This book had all the ingredients that make a Flavia de Luce mystery the mysteries that I turn to time and time again. In this case Flavia has returned home from Miss Bodycote’s Female Academy to find, instead of the homecoming that she expected, that her father is in the hospital and her sisters have already gone up to bed. The next day, Flavia is asked to do a favor, to go visit Mr. Sambridge to deliver a letter. She hops on her trusty bike, Gladys and heads over, only to find him dead. And with that the mystery begins. I am usually completely lost through most of these mysteries, sometimes putting pieces together before Flavia, but rarely. This book was everything I expected and I enjoyed it from beginning to end. Sounds good and the cover is cute. I agree with you about these books – but I also love them. Can’t wait to read this one.